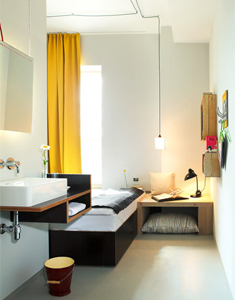 Werven Aisslinger has completed a budget hotel designed to feel like staying at a friends house in Berlin. 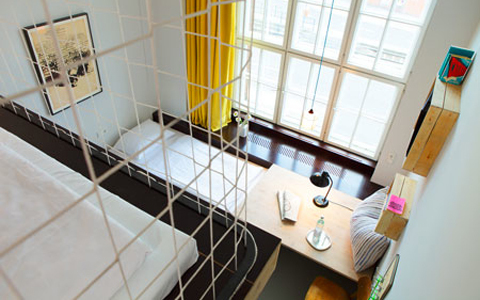 The Michelberger Hotel is housed in a converted factory building featuring a brick facade, high ceilings, large windows and a courtyard that acts as the social hub of the hotel. Anja Knauer and Sibylle Oellerich collaborated to design the hotel interior using objects sourced from local flea markets, often re-purposing them for other uses, and low-cost materials such as laminated larch. Each room features a unique wallpaper designed by Azar Kazimir depicting symbols and images significant to the hotel and its founders. 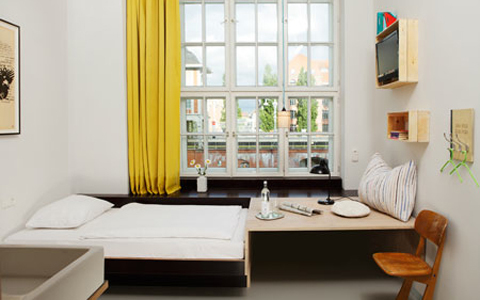 Three room sizes are available for individuals and groups of up to four people, as well as the more extravagant Luxus room, combining elements of hotel and hostel aiming to attract both backpackers and business men.